Tailgating in the South combines two things: passion for college football and the love of great food. Oh, and a little healthy recipe competition to make game days extra fun! Southerners are known for taking tailgating to a whole new level and for taking it very seriously. To help you make the most of your season, we’ve developed a collection of delicious dairy recipes that will certainly please your tailgating crowd—whether you are at the stadium or in front of the big-screen TV. There is a recipe for each major football team in the Southeast area, but you won’t be out of bounds if you decide to try all of them! There is just no way that you can score points for tailgating without nutritious and versatile dairy products such as milk, cheese, and yogurt. What’s a sandwich without a slice of Cheddar? What’s a dip without creamy Greek yogurt or melted mozzarella? And leading sports nutrition experts will tell you that chocolate milk is the preferred recovery beverage for athletes—and that includes armchair quarterbacks! Pulling your team through a close game takes a lot of energy, so you’ll definitely need a gulp of replenishing cold chocolate milk. And since tailgating is as much about the presentation as it is the food, we’ve added some craft projects and ideas that will ensure you aren’t outscored at your next tailgating event. These are really simple ideas like cutting cheese into Xs and Os, creating “football laces” on glass milk bottles with first aid tape and wrapping sandwiches in team-colored ribbon. The dairy farm families of the Southeast are proud to produce the wholesome and nutritious dairy foods that help make your tailgating gathering a delicious and memorable event. No matter which team you cheer for, you’re guaranteed a win when dairy is on the table. Just sign up for our SUDIA monthly newsletter. 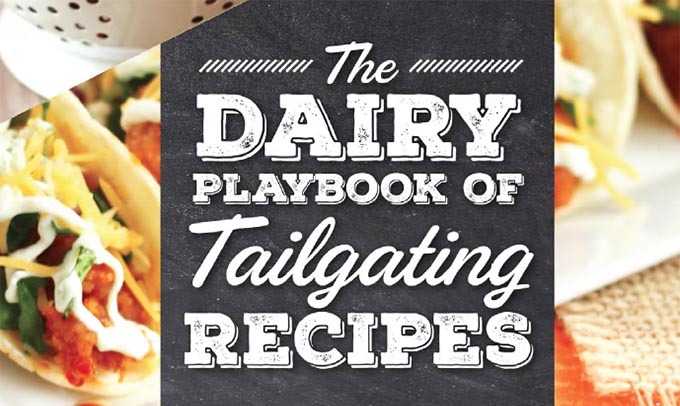 Click here to download a copy of The Dairy Playbook of Tailgating Recipes, complete with 13 team-inspired recipes and our Top 10 Tailgating Tips.